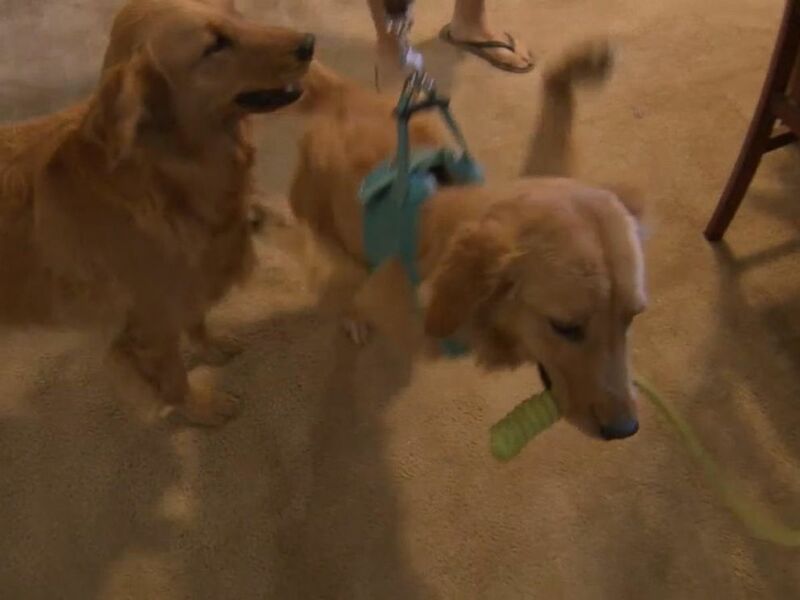 A couple from southern California is appealing to the public for help in solving their Golden retriever puppy's medical mystery. The 9-month-old dog is named Rexi, for her similarities to a T. Rex dinosaur, according to her owners, James Cassidy, 31, and his wife, Rachel Woertink, 32, from Phelan, California. Like the dinosaur, Rexi can only walk using her hind legs. And as for her paws, they just flail upwards in the air like the little arms of a T. Rex. "It's definitely a little awkward," Cassidy told ABC News today. "She can stand up and use her back legs fully, and then she scoots around on her chest kind of like a snail." Because Rexi's upper body often scrapes the ground she's walking on, she's developed a few sores on her chest and neck, Cassidy said. But other than that, he said the Golden retriever "doesn't appear to be in pain." "She's definitely a super loving, happy and hyper dog," Cassidy said. "She's just like any other Golden retriever. She loves chasing tennis balls, going outside and playing with the other dogs." Currently, Rexi doesn't have a regular veterinarian, Cassidy said, explaining that he and his wife took the pup to a couple of local vets months ago, but they weren't able to get many answers or recommendations for specialists. "They all did X-rays and whatnot, and the results always showed her bones were fine," Cassidy said. "A lot of the veterinarians said it could be neurological, and some of them just recommended that we amputate her front legs or put her down." But both options were a "nope" for Cassidy and his wife, he said. A couple from Phelan, California, said they are appealing to the public for help solving a medical mystery for their dog, Rexi. The nine-month-old pup's front paws flail upwards, according to the couple. "We didn't want to amputate her front legs since they still seem to have some movement," he explained. "Though she can't walk on them or control them, if you lay her on her back, you can stretch them and move them to a normal position." Cassidy that he and his wife would never euthanize since Rexi doesn't appear to be in much pain and because she's like a child to them. "It wasn’t her fault she was born this way, and we love her," he said. "Right now, we're just trying to get any help we can get." Cassidy and his wife have started a GoFundMe campaign online in the hopes that they can be referred to a specialist or engineer who can help them solve Rexis' medical mystery. "Obviously, whatever the solution may be will probably be very costly, but our number one goal really is to find a doctor or specialist who could maybe do surgery to fix her leg," Cassidy said. "Our second option is to get connected to an engineer or company that could maybe custom-design a device or apparatus to help her walk without scraping her chest and neck." Cassidy added he and his wife actually recently bought a custom wheelchair for the puppy, but it toppled over easily whenever Rexi ran too fast. "We don't use it really because we don't want her to get injured any more than she already is," he said. For now, Cassidy and his wife are pouring through hundreds of emails and calls they've since received since starting their campaign. "We're going to look into every recommendation and check out every avenue thoroughly," he said. "We've been blessed with an outpouring of support."